I have to be honest. Teaching writing is tough. Each year, I set out to build a community of writers, and it is no easy task. One of the toughest things for my students is writing endings. They always start out with catchy beginnings only to get bogged down and just stop at the end. I typically follow the Writers Workshop model in my classroom, as I have found the most success with this management style. We always spend quite a bit of time writing narratives, as I believe this genre is the most fun for students. It allows them to be creative, and it helps me to identify their voice as a writer. 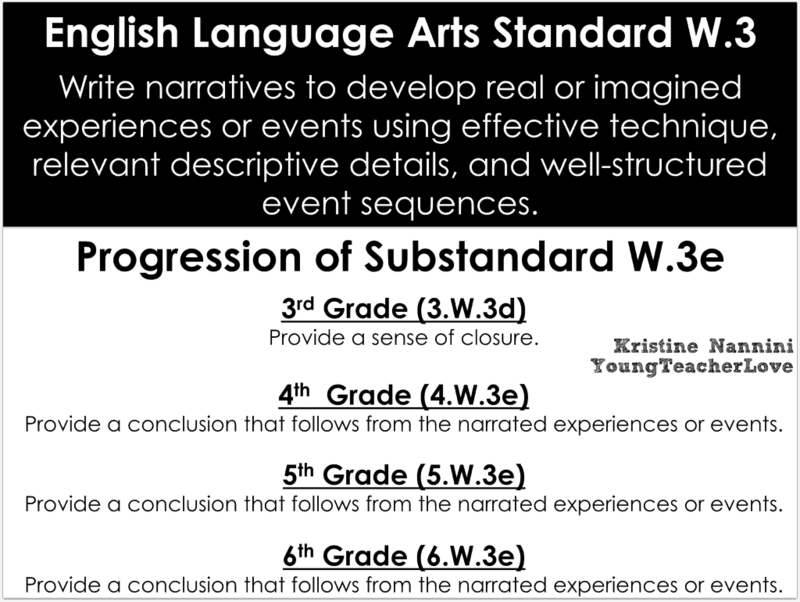 To start our mini-unit on writing endings, I gave my students a pre-assessment of the substandard to figure out where their knowledge is with writing endings. 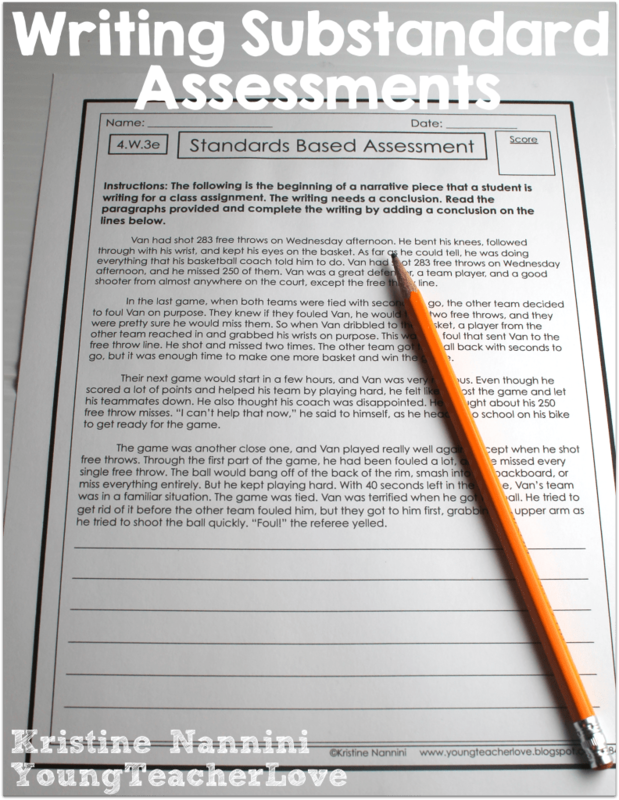 These substandard writing assessments are from my English Language Arts Assessments and Teaching Notes for grades 3-6. I call them writing partial completes in each of my assessments. For each writing substandard, I include writing passages that are not complete. 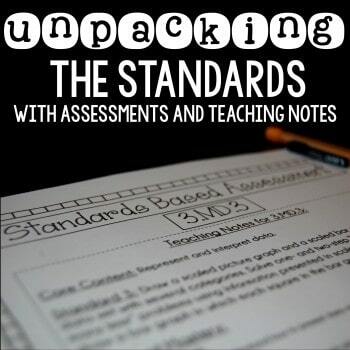 Students must complete the writing to show their knowledge of the standard. You can see for this substandard assessment above, the ending is left out for students to complete. Once I pre-assess students, I can then quickly check their work to figure out what I need to modify or differentiate in my teaching. Once I hand back their pre-assessments, they document their scores in their Student Data Tracking Binders, rate their levels of understanding of the standard, and we begin! 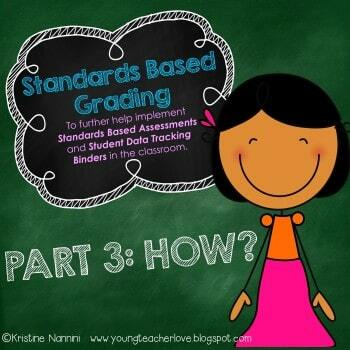 We start our lesson by addressing the standard so students know where they are headed with their learning. The great thing about this substandard is that it is extremely open ended. As long as students provide some type of closure or conclusion that follows from the narrated experiences or events, they will meet the standard. The way in which a student can get there is endless. 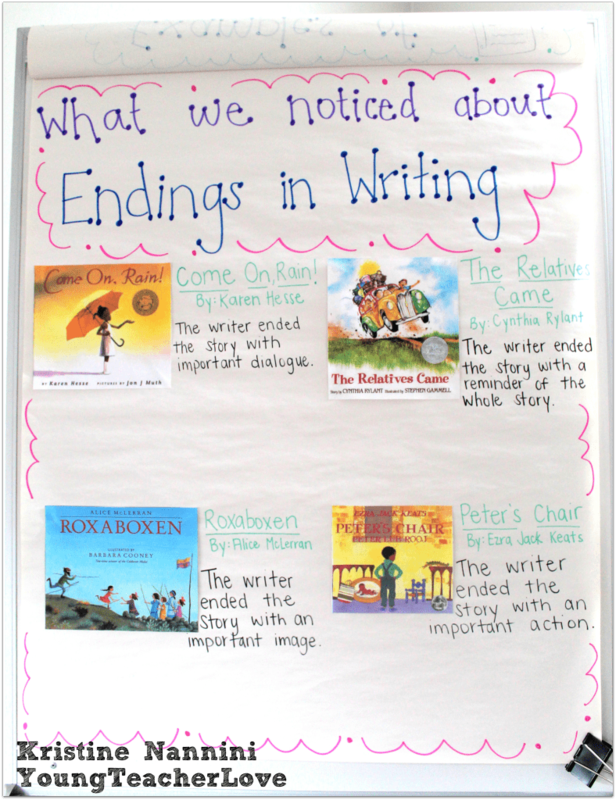 The main thing I focus on when teaching endings is to notice different endings in all of the literature that we read. Most of the time, students just finish a book without any reflection on the different strategies the author used to end the story. On day 1, I brought out mentor texts that my students were already familiar with, and we “noticed” different endings the author used. Once I modeled this with one or two mentor texts, I then turned it over to students for their active involvement. I read a book (or just the ending of a familiar book), had students turn to a neighbor and share what they noticed, and then we came back together as a class to discuss. We then worked together to compile an anchor chart of what we noticed about the endings of these mentor texts. After our mini-lesson, we linked what we learned to students’ work time. On this first day, I had students work in small groups to notice different things about endings from more mentor texts. I put out a basket of books on each table for students to read through. Then, they used sticky notes to write down what they noticed. After students had been given enough time, we came back together and shared more of what we noticed. This ended our lesson for the day. But if there was time, I would have encouraged students to go back to their writing notebooks to revise their stories based on what they’ve learned so far. Note: If you feel like your students need an extra day with any of the mini-lessons, give them that time in order to make sure they understand the content. Each class is different. Some students may need more time, and some may need less time. On day 1, we noticed different ways in which authors end their stories. On day 2, we focused in on the specific strategies those authors used to end their stories. We revisited a few more picture books as mentor texts. I specifically chose mentor texts with endings that I knew my students needed a bit more help with. For example, I knew they were extremely familiar with the question, dialogue, and funny endings, so I chose to grab mentor texts that had cliffhanger and reflection endings to give my students the extra practice. 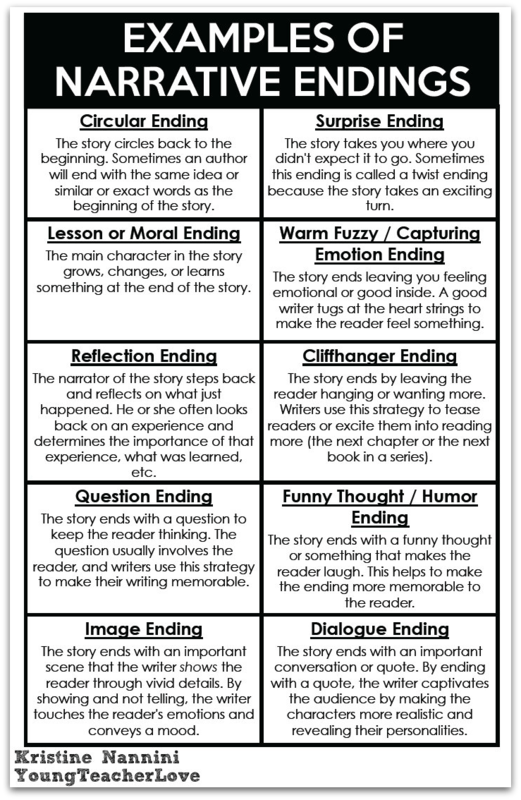 Together, my students and I created this anchor chart to identify different endings authors use (you may use more than just these endings, but these are the endings we focused on). We gathered this information from all of the different picture books we looked through the day before. I created a printable version of this anchor chart for students to reference. You can click HERE to grab it as a freebie to use with your students. 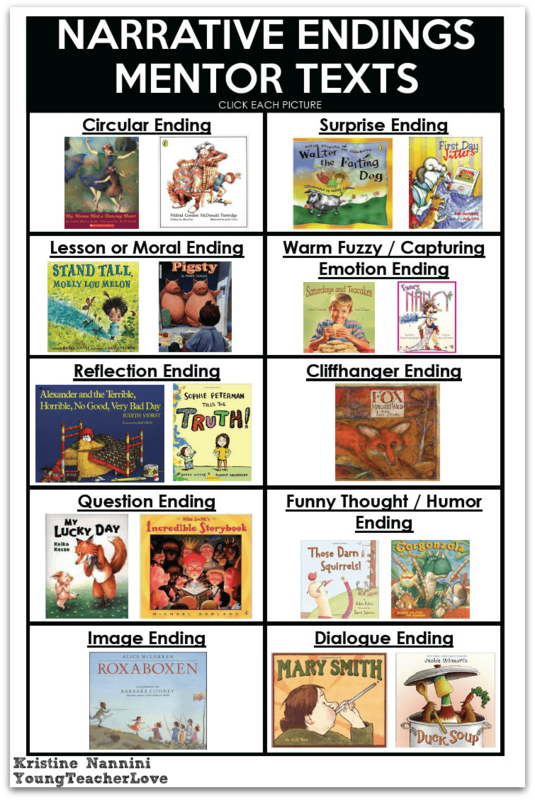 If you need more mentor text ideas for each ending, check out the list I’ve created for you! You can download this page HERE, and click each book cover to check out each book! After our lesson, students went back to their seats to sit and explore even more picture books. 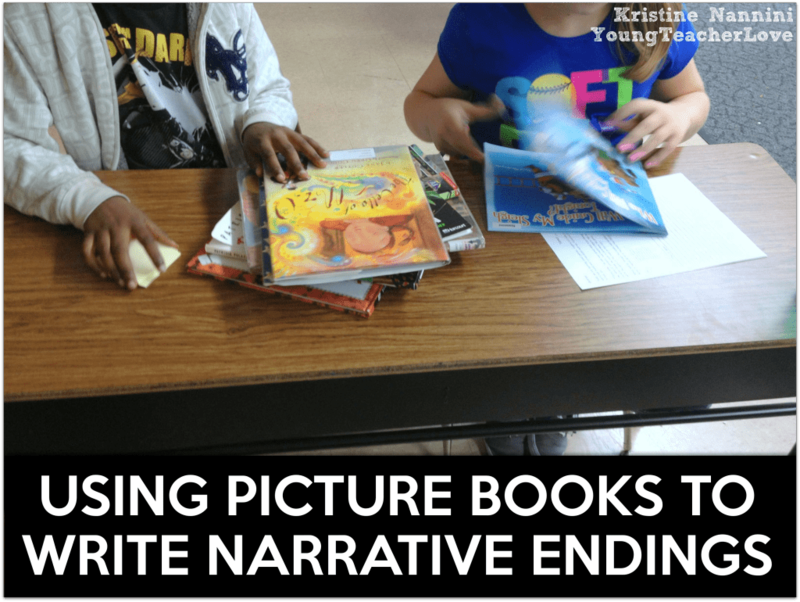 Now that students can name each ending, they can have a different focus when they are sifting through these picture books. 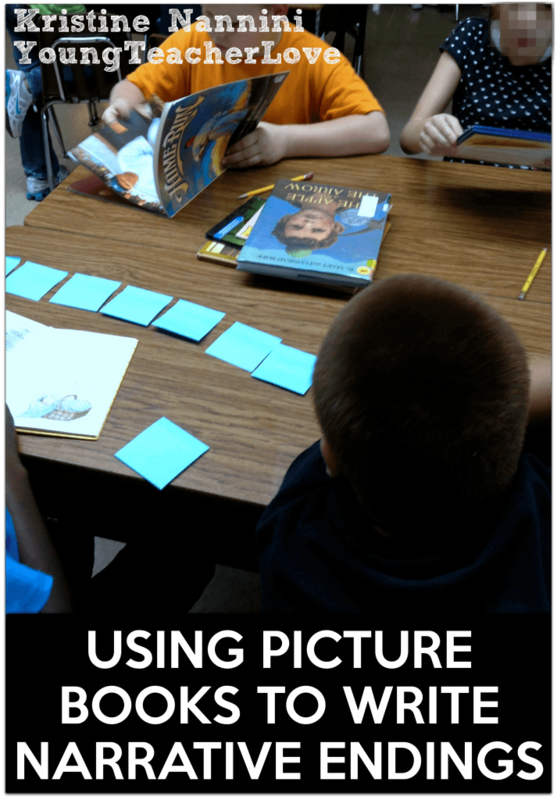 With any writing lesson, the more students are exposed to examples of real writing in picture books, they better chance they have to use those specific strategies in their own writing. After students had been given enough time to explore more endings, we came back together as a class and shared our findings. 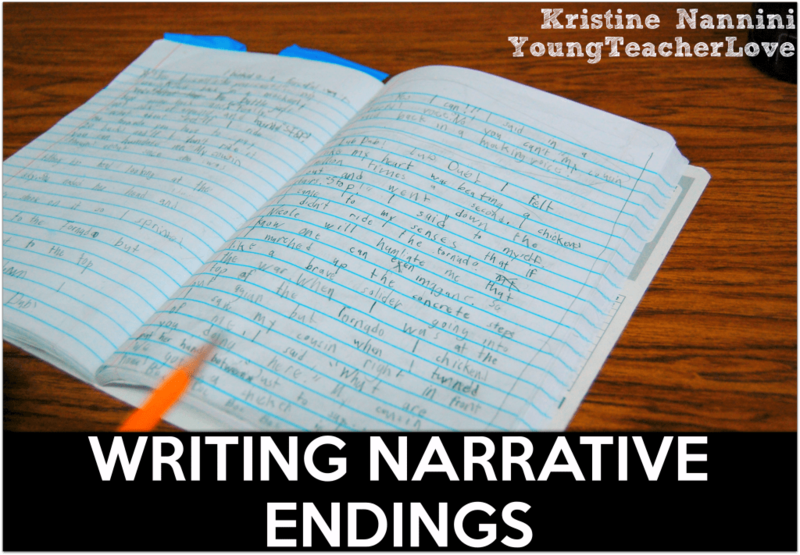 Since students had two days of exposure to different types of endings in numerous picture books, I gave them the opportunity to go back to their own narrative writing and work to revise their endings using the strategies we’ve learned over the last few days. Since this mini-lesson was a bit longer, students only had a few moments to go back to their writing. I told my students that this was a great time to start brainstorming what type of ending would fit best with the writing they had already done on their personal narratives. When conferencing with students, I noticed that some students had jotted down a list of certain ideas or an ending types they wanted to include in their writing so they could come back during our next writing lesson and get right to work! Students have now had at least two days worth of exposure to many different types of endings. We’ve read many different picture books as mentor texts for these endings, and we have worked together to create an anchor chart of different endings authors use. In addition to this, I reminded students that the main focus for day 3 was for them to really get into their own writing, and they were eager to do this by day 3! Note: You can decide whether or not it’s worth it to pull your students to the carpet for your recap mini-lesson, or if you’d rather just keep them at their seats for this. I typically keep my kids at their seats and remind them that today’s focus is just to WRITE using the strategies they have learned about writing endings over the last few days. While my students worked to revise their endings, I pulled small groups for re-teachings, conferenced one-on-one with a few students, and walked the room peeking over the shoulders of as many writers as possible. I especially kept my eye out for students who had done a great job revising their endings with the strategies they learned. It’s always best to use your students’ examples in front of the class. After having the chance to write for some time, I stopped my students and pulled them back together to quickly discuss their progress. I asked for volunteers to share what they did to revise their ending, and I noticed a particular student’s piece that was great, so I asked him if I could share it with the class. I always find that when I share a student’s example, many students are really tuned in, and often go back and start writing even more! To share their work, I put it under the document camera for the entire class to see. After this quick interruption, I invited my students to think about the examples they saw in their peers’ writing and get back to it! This day depends on your students and their progress with the standard. I typically gauge my students’ understanding with their work to make a decision as to whether or not they need more time to work on their endings and if students need more time for interventions and reteaching. If they do need more time, I make sure to continue conferencing with students. I pair students up to revise each other’s work and give constructive criticism. In addition to this, I may pull a small group of students to review even more mentor texts with them. Again, it depends on your students. 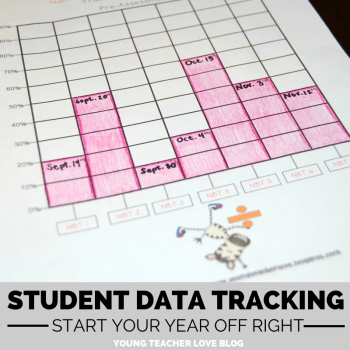 If you feel that your students have had enough time, and are successful with revising their endings, you can complete the post-assessment of the standard and have them graph their scores in their Student Data Tracking Binders. This is fantastic! My problem with my students is not “The End”, but an abrupt ending with no closure and the words “To Be Continued.” So a lesson on endings is just what I need. Thanks so much, Deena! 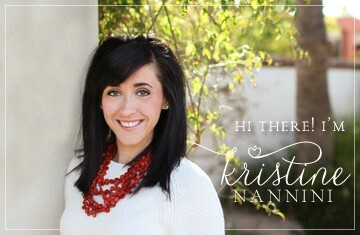 I’m so glad to hear this lesson will be helpful for your students! I read this blog post last week and thought it was great because my class is currently working on narrative writing. One of my author chairs shared a story on Tuesday and ended it with The End. I pointed out that though her story was wonderful I was a little disappointed to hear The End at the end because I have noticed that authors usually end their books in a way that I know it is the end without them ever uttering those words. We are having a funeral for The End today, followed by your lessons on ending! Thank you for this great resource. You are an awesome teacher!! I love that! Thank you so much for your kind words! I hope your lesson went well! 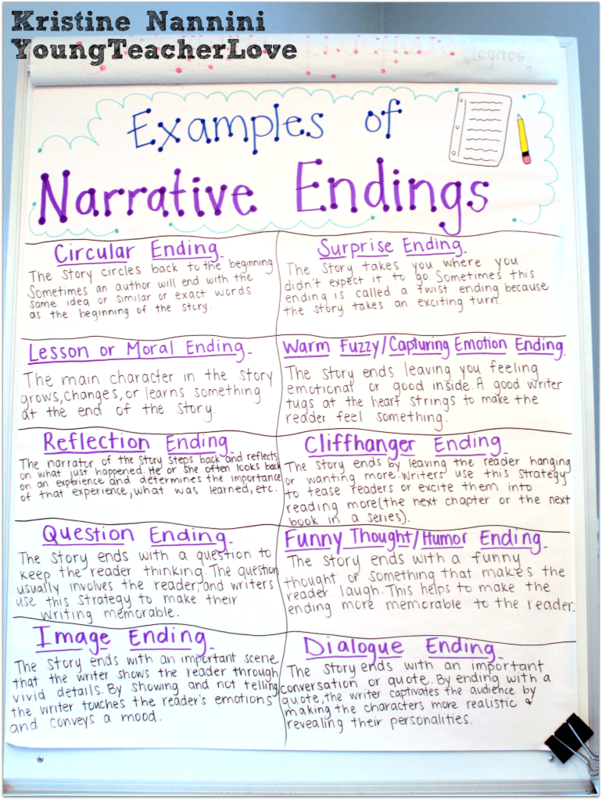 Love this idea this will help me in the future when I become a teacher , and with picking a good ending my narrative essay ! Thanks so much for your kind words, Mel! I’m so glad to hear it will help you! This looks fabulous and thorough! You’re right, we do tend to focus more on starting off strong. A strong finish is important too! Thanks so much for your comments, Alicia! Thank-you so much for this resource! I was racking my brains for a good resource for supporting kids with endings (there are so many for beginnings) when I came across your website. I got so much more out of it than I expected. Thank you so much, Brittany! I appreciate your kind words! I love this, too. I teach 8th grade, though. We tend to read longer texts. How do I amass a set of stories for the students to use to examine endings without having to wait until we are far into the year? We do personal narratives during first marking period. Where can I get the copy of your post page? Why now I can’t do the questions w/o reading thanks thanks a lot ? This definitely will be helpful for the students. Thank you so much for the tips on “endings”! I can’t wait to get my hands on these mentor text and allow my kiddos to explore different endings! I teach beginning reporting and writing at the college level as an adjunct and your example of narrative endings just rocks it! Endings are hard and endings are usually the reason there’s a line at the front of the room when class is over with half a dozen laptops held up for advice. Thanks! Loved your tips about writing essays.